We are pleased to have an unusual and interesting interview today with our new friend Gidget Bluesky and our old friend Honey P. Sunshine, who went to the bridge May 29, 2015. Gidget Bluesky: My name iz Gidget Bluesky. I will be 4 years old on September 18. I am a Virgo. I am a gray and creamy white tabby cat. My belly iz the creamy part. I live with my mommie, Carla, and the Honey Sunshine Spirit Cat. Honey Sunshine Spirit Cat: Hi effurywun, iz me the grate Honey Sunshine. I lived with mommie before Gidget. I am a Cancer and mommie iz a Capricorn. I don’t have a fursuit anymore so I fly around up by the ceiling over the sofa. Gidget can see me. Sometimes I visit mommie on the bed at night. Mommie misses me lots so I have to visit her lots. Our hearts are joined furever. Honey Sunshine Spirit Cat: I came from Happy Tails in Sacramento and lived with mommie fur 15 years before I had to leave. Mommie and me were the best of furrends and soul mates. Gidget Bluesky: I came from Friends Forever in Auburn California. Mommie searched fur me after the Honey cat had to leave. She wanted a girl tabby cat that wuzn’t a baby and I had to be a compatible astrological sign fur mommie. That wuz impurrtant fur mommie and me so that we could live together forever. Mommie wuz very, very sad when Honey Sunshine left. Her heart wuz broken for a very, very long time. I helped heal her heart. Gidget Bluesky: We live in Sac-of-tomatoes in a condo that haz big, big, redwood trees and floor to ceiling windows and there iz burds and sqwerrles efurrywhere. This summer we even had baby ducks on our deck because the mommie duck laid her eggs on the roof. My mommie had to rescue them when they landed on our deck trying to get down to the mother duck on the ground. They kind of freeked me owt because they were running around peeping all ofur the place! Gidget Bluesky: Mommie calls me bubbie, that’s a chewish term of endearment fur grandmother. It wuz Honey’s nickname too. We are not chewish, we are Catlick but mommie wuz born near New York city and grew up eating lox and bagles so there are things that are hardwired into her weird little brain. Honey Sunshine Spirit Cat: I was the mischievous one. I liked to drop my toys into the toilet and play soccer with my ping pong balls. I was an expurrt ball handler. Gidget Bluesky: I’m not really that mischievous though one time I chewed through the innerweb wire in the closet and made the innerweb go dead. I also like to take trips on my majic-car-pet after eating a little catnip. 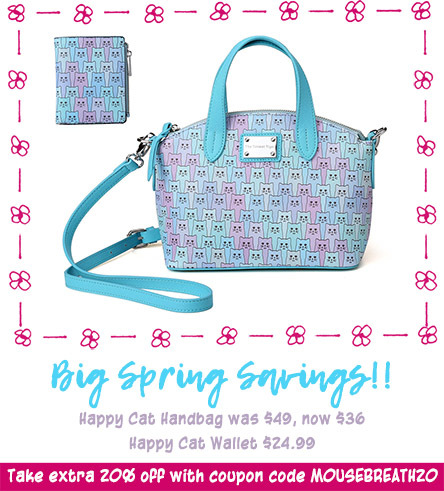 Honey Sunshine Spirit Cat: I started blogging after I met the grate Jeter Harris, Skeezix and Daisy the Curly cat on Catster way back. Jeter talked me into starting a blog. 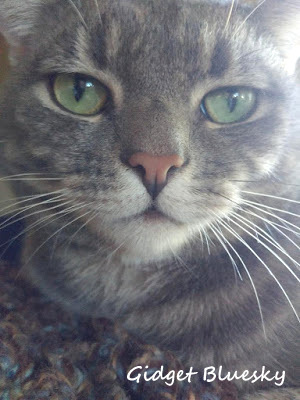 Gidget Bluesky: When I got here I had to have my own blog so efurrywun could see how purrty I am. I am currently werking on photos for my modeling purrtfolio. 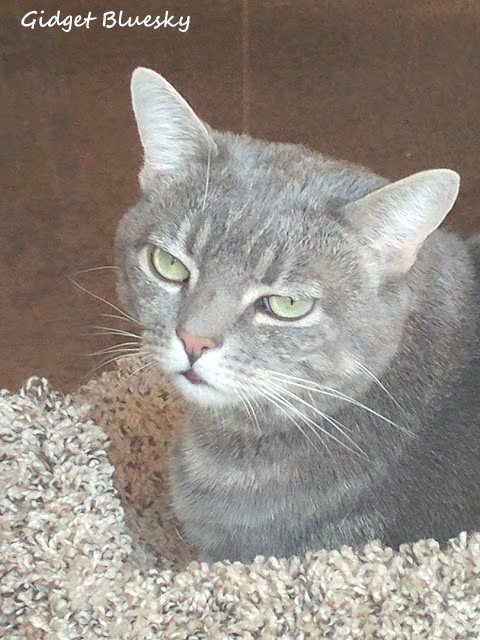 Gidget Bluesky: My greatest fear is that we run out of cat treats and my greatest love is cat treats. Honey Sunshine Spirit Cat: My greatest love wuz my mom and my greatest fear wuz having to leave my mom. Honey Sunshine Spirit Cat: I was totally an extrovert and totally a sooper snoopervisor. I liked to be where the action was. I loved to smell everybody’s shoes and get into everybody’s purse when people came over. Gidget Bluesky: I am totally an introvert. I hide when people come over. I don’t hide from my mom though. I hang out with my mom all day long when she is home. We have long conversations, me and mommie. I am usually sprawled out in the middle of the living room floor or napping up on my new pedestal. I will still go and nap unner the bed cause it make me feel secure. Honey Sunshine Spirit Cat: Not me, I was sprawled all over the bed, or the sofa, or in my hammick by the window werking on my furtan. Funny Farmer Felines: If we were to ask your human mom what she loves best about you, what do you think she would say? 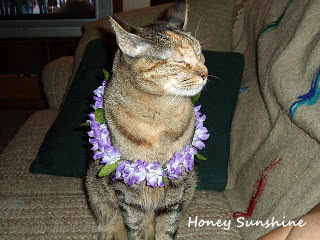 Honey Sunshine Spirit Cat: Mom loved my easygoing spirit. I was very laidback. Go with the flow. We love checking all the blogs efurry morning. It makes mommie’s heart happy. 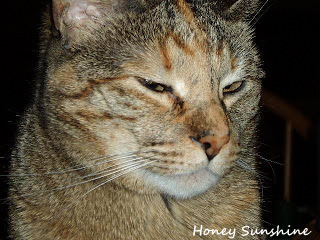 Funny Farmer Felines: We have enjoyed being reminded of blogging days with Honey P. Sunshine. Honey has rarely posted on her blog since she had to leave, but it was nice to go back and read of her life before the bridge. It was such fun learning about you, Gidget Bluesky, and how Honey is still with you and your mom. We look forward to getting to know you even better. We are still open to learning of new cats on social media, Cat Scouts, blogging cats (all cats have a story!) to interview. Contact us. (We contact bloggers as we come across them but there are so many of you and only 5 of us. Terrific interview, and nice to meet you, Angel Honey Sunshine…didn’t know about you before Gidget. I’ve seen Gidg fly on her magic carpet in a post..WOW! I grieved when Honey Sunshine flew away. It is nice to meet you Gidget. You look a lot like my mommy’s spirit cat Lucky who was also very shy. Also the same to you, Honey. My mommy remembers Skeezix, Daisy and Jeter also and really miss them. 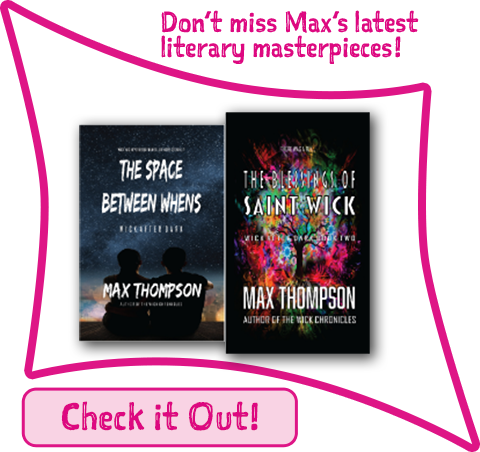 They are all three the ones who got me interested in replying and now blogging a bit too! I’m not very good at it yet, though. Nice to learn more about beautiful Gidget. Honnie Sunshine was beautiful too. Honey- so good to hear from you! Hi sweet Gidget! Honey P. Sunshine! Hi Honey and Honey’s mama, from Halloween’s mom. Halloween went over the bridge 8 years ago but we remember Honey very well. Greetings from SF. Many happy cat blogosphere memories….